Last year’s winning team from Okinawa College of Cooking. The sky is the limit for imagination when, for the second time, student teams from Okinawan schools that specialize in enrolling young students who want to become professional cooks and chefs are facing each other in a creative cooking contest to determine who has what it takes to create a completely new dish. The only limitation is that the dish must contain tuna fish as the main ingredient. The audience will also be able to pick their favorite dish as food samples are offered for ¥300 a plate during the event as the dishes get prepared. As an extra incentive, one can buy tickets from a booth at the venue for ¥500 per two tickets worth ¥600. Also, free tuna sashimi is served for the first 1,000 visitors on each event day. Last year’s winning dish: tuna and pork cubes on a tortilla topped with cheese, guaranteed original for sure. This years’ participating schools are the Ryukyu College of Cooking, Okinawa College of Cooking, College School Taiiku, Okinawa Prefectual Gushikawa Commercial High School Business Multi-media department and Okinawa Prefectural Hokubu Agricultural High School – Life Science Department. 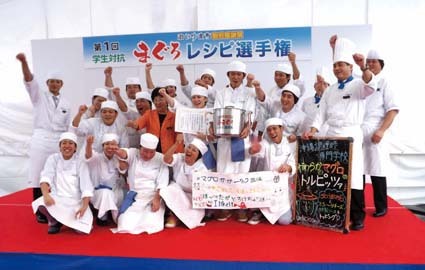 Last year’s grand prize was awarded to the Okinawa College of Cooking located in Kume, Naha City. The winning dish was tuna-based pizza-like dish that comprised of pieces of tuna mixed with the Okinawan-style stewed pork cubes giving it a slightly sweet taste, placed on a tortilla and topped with cheese. 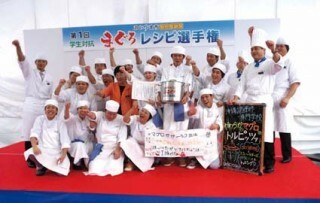 The 2nd Student Tuna Recipe Championship is held at Tomari Iyumachi in Minato, Naha, right next to Tomari Bridge, on Sat. and Sun, from 11 a.m. to 5 p.m. Admission to the event is free.